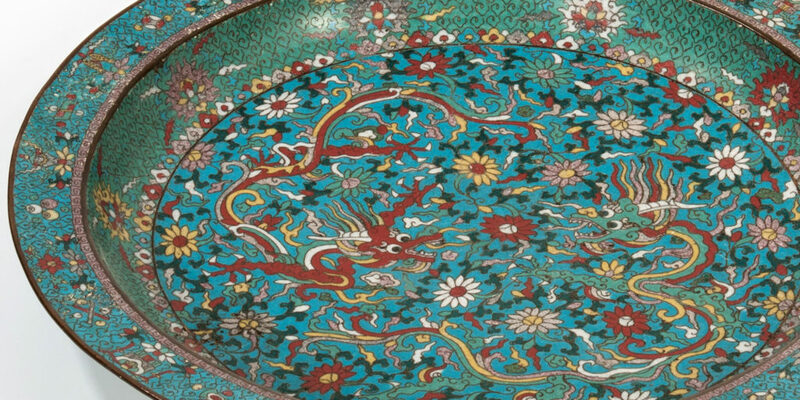 Chinese Cloisonne Charger Hits $315,000 at Skinner | Skinner Inc.
BOSTON, MA – March 25, 2019. The Skinner March 22nd Asian Works of Arts auction presented the arts of China, Japan, Korea and Southeast Asia dating from Neolithic times through the 20th century. Featured were examples of Chinese monochrome ceramics, Gandharan and Sino-Tibetan Buddhist sculpture, Japanese Satsuma ware, and Chinese textiles. Property from estates and collections long off the market showed their strength with many examples selling above estimate pushed by competitive bidding from international and domestic bidders in the room, on the telephones, and via live internet bidding resulting in a sale 90% sold by value. An email inquiry from private owners in New England led to the consignment of a Chinese cloisonne charger brought back by a family member from China in the early 20th century. With decorative devices including dragons, ruyi clouds, and the Eight Buddhist Treasures, it bore a six-character Ming Wanli mark. Multiple online bidders competed with the telephones to push the lot to $315,000. An extensive collection of Monochrome Chinese Ceramics from a New England collector exceeded expectations as the group with its breadth of color and form that appealed to collectors of every period of Chinese ceramics. 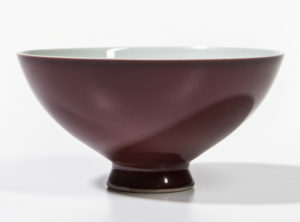 Examples ranging from an egg-yolk yellow dish, Jiajing mark and period, sold for $20,910 to a Sang-de-Boeuf Bowl, six-character Qianlong mark sold for $19,680. A serene bronze Manjushri of fine quality sold for $18,450, part of a group of Sino-Tibetan bronzes collected by the current owner’s father while employed by Standard Oil in the 1930s in China. 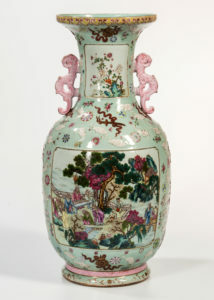 Other auction highlights included a Massive Famille Rose Enameled Vase, with illustrated scenes to the panels brought an impressive price of $43,050, a contemporary painting by Ji Dachun (b. 1968), Oil on Canvas, China, 2001, depicting two men behind a desk with a map, against a blank background, signed “Dachun” with year “xinsi” in Chinese, sold for $18,450. Ornamental Kingfisher Hairpin and Earrings exceeded their $800-1,200 estimate to fetch $8,610. A Canton Enamel European-themed Covered Bowl, China, dating to the 18th century, and sold to benefit the Clark Art Institute, Williamstown, Massachusetts sold for $10,455. Department director, Judith Dowling remarked on the well-attended auction previews, the high number of requests for additional images and information and that with the pre-sale interest she was “delighted to see material selling for above estimate, reflecting a strong market.” Skinner is currently accepting consignments for 2019 auctions. We invite consignors to take advantage of this robust market to sell Chinese, Japanese, Middle Eastern, and Central Asian art, objects, and furniture. Visit skinnerinc.com to learn more. This entry was posted in News and tagged asian antiques, Asian Art, asian art auction, Auction Highlights, auction results, Chinese antiques, Chinese art, Chinese porcelain, cloisonne, contemporary asian art, Ming dynasty, monochrome ceramics, Sino-Tibet bronzes, Tibetan art by Skinner. Bookmark the permalink. I like your article. Your antique pieces are really unique and amazing. I am also finding such types of pieces. Please keep sharing.